Duchateau is a maker of stunning wide-plank hardwood floors. They use innovative texturing and distressing techniques to give you a look that's above and beyond ordinary. 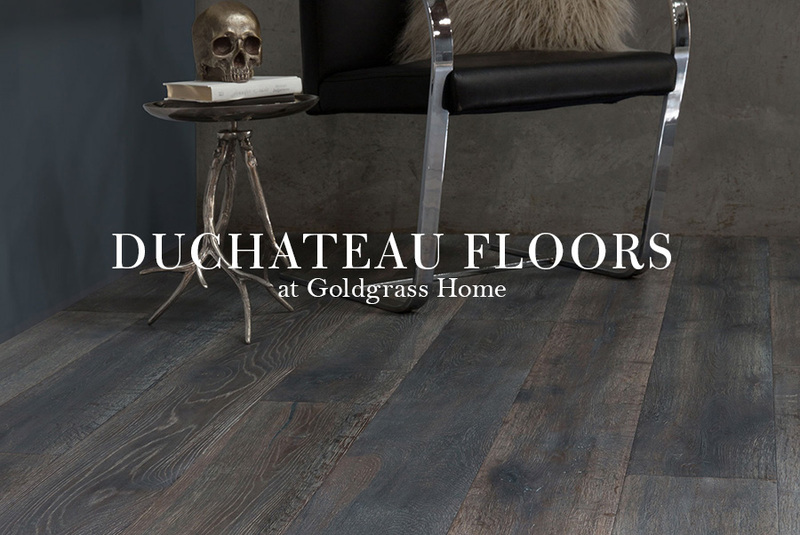 Your guests will marvel at the rugged, sophisticated styles your Duchateau floor brings to your home. Duchateau floors are impeccably crafted, and built to endure. Much of their texture and coloration is achieve through a variety of distressing methods such as charring, smoking, liming, and so on. Because of this, the unique colour and texture of your floor runs through the wood, rather than simply sitting on the surface. Their European-style hardwax-oil finish not only feels warm and natural under your feet (rather than being a plastic layer) but also ensures easy lifetime maintenance, without you ever needing to sand and refinish. Duchateau offers a wide-variety of designs and shades, ranging from clean and clear, to rich and rustic. You're sure to find the perfect floor to set off your project. Visit the Design Centre at our Inglewood Goldgrass Home Flagship location to see our stunning collection of Duchateau!